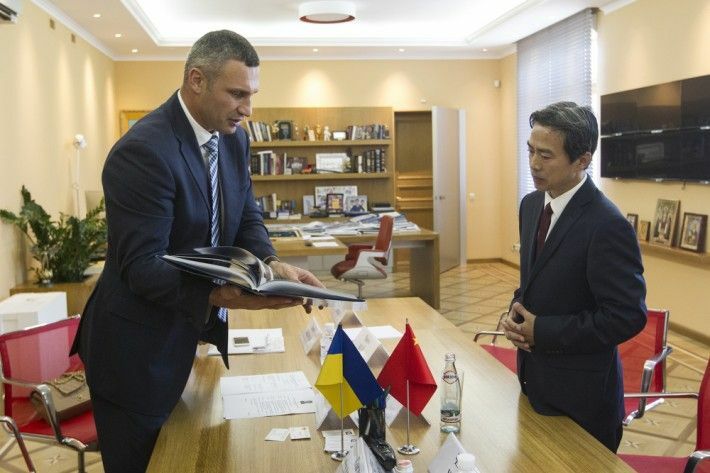 Kyiv City Mayor Vitaliy Klitschko and Chinese Ambassador to Ukraine Du Wei have discussed prospects for cooperation in tourism and technologies and ways to attract new investments. "We are looking forward to fruitful cooperation for our countries' mutual benefit," Klitschko told the Chinese ambassador, congratulating him on his appointment as ambassador. "I'm sure you'll have the opportunity to feel the atmosphere of our city and communicate with the people, and I hope at your post, you'll further develop these good relations established between the municipal authorities and your country's diplomatic mission," Klitschko said. According to the mayor, China is a strategic partner of Ukraine and Kyiv, in particular, in acquiring new technologies and investments in the areas of IT, engineering and agriculture. Read alsoAntonov to manufacture An-225 Mriya aircraft in ChinaDu Wei in turn thanked Klitschko for the reception and praised Kyiv's support of the Chinese Embassy. "I hope that during my tenure, we will be able to achieve closer cooperation between Kyiv and Chinese cities. Our embassy is ready to contribute to facilitating Chinese businesses' work in Kyiv. We would also like to take this opportunity to invite Chinese entrepreneurs on your behalf to an international business forum, which will be held in Kyiv in October, so that they can make their contributions to the development of the Ukrainian capital," the diplomat remarked. Read alsoKlitschko says Kyiv to get 15 used snow removers from GermanyThe parties pointed to the importance of ensuring a favorable investment climate, in particular, the transparency of municipal management and the lack of corruption. They also touched on the development of tourism cooperation and a more intensive cultural exchange between the two countries. "Kyiv's tourism potential has not been fully unlocked, so we see cooperation in tourism as a priority for our cooperation," Klitschko said.